Both the Venturing Ranger and Silver Awards of today came from designs, names and concepts similar to the Explorer Ranger and Silver Awards of yesteryear. Below are all the badges and medals associated with these two sets of awards, past and present. For the new Venturer working towards the new awards, be proud that you are part of a tradition that is being reestablished. For the Explorer from the past who earned one or both awards, we honor you for what you achieved and hope you are proud that the awards once again can be earned. The Explorer Ranger Medal was issued between 1946 and 1951. The Venturing Ranger Medal was first shown in 1998. However, it could not have been earned until 1999. The Explorer Ranger Badge was used for normal uniform wear and was issued between 1944 and 1949. The badge was centered on the left pocket. The Venturing Ranger Bar is intended for normal uniform wear. The First Ranger Bar was available between 1998 and 2001. In 2001, the bar was redesigned. The Ranger Bar is centered on the left pocket flap. The Explorer Ranger Square Knot was issued between 1950 and 1951. The Ranger program had been officially discontinued in 1949 but Scouts could continue to work on the Ranger Award until 1951. The square knot could be worn by both youth and adults. After 1951, the square knot was only available in stock that remained. Beginning in 1954, if you earned the award but did not have the square knot, you wore Silver Award knot pictured below on the yesteryear side. There is no square knot for this award today. This Explorer Silver Medal was issued between 1954 and 1965 and is referred to as the second type. The first type was issued from 1950 to 1953. The design is completely different. After 1958, Explorers discontinued their advancement program and only Air Explorers were able to earn this award which lasted through 1965. 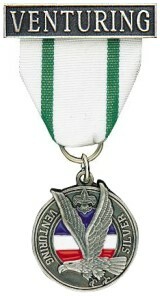 The Venturing Silver Medal was first available in 1998. Both the Explorer and Venturing Silver awards require that you earn a Bronze and Gold award first. The Explorer Silver Badge was used for normal uniform wear and was issued between 1954 and 1965. The badge was centered on the left pocket. 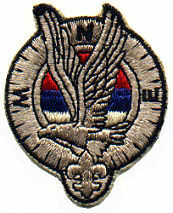 The is no equivalent badge. The Venturing Silver Square Knot is intended for normal uniform wear by youth, see below. The Explorer Silver Square Knot was used for normal uniform wear by adults and was issued between 1954 and 1998. This square knot is used for holders of the Silver Award, the earlier Air Ace Award and Ranger Award, and the later Explorer Achievement Award and Exploring G.O.L.D. Award. Youth would wear the square knot for the Explorer Achievement Award and the Exploring G.O.L.D. Award. The Venturing Silver Square Knot is intended for normal uniform wear by youth and adult. The Venturing Silver Square Knot was first available in 1999. This is not an official site of the Boy Scouts of America. 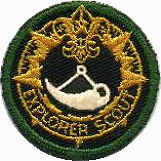 The Explorer and Venturing badges are scanned images of my collection and are copyright. You are welcome to print these pages for your reference. However, if you would like to use the images in any other manner, you must receive permission from Craig Murray.